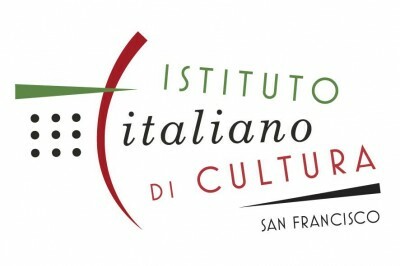 San Francisco's annual New Italian Cinema series is programmed by New Italian Cinema Events (NICE), which has long performed this role of showing new Italian films in a small festival in New York and San Francisco with the aim of promoting new Italian cinema to a sympathetic American audience. Viviana del Bianco is director of the Florence-based organization. Filmleaf will again provide coverage of this series. Francesco Falaschi’s delightful romp takes us on a culinary road trip to Florence, culminating in a contest for young cooks. Arturo (Vinicio Marchioni) is a veteran chef with minor anger management problems who, after a short stint in prison, performs community service at a school for teens with Asperger’s. His students are eager to learn, especially Guido (Luigi Fedele), a young man who remembers every ingredient in every recipe. Arturo delays his move to Milan to cook in a sleek restaurant when the opportunity arises to accompany Guido to a cooking competition in Tuscany’s capital. Complicating matters is the fact that the president of the jury, celebrity chef Daniel Marinari (Nicola Siri), is Arturo’s hated ex-business partner and Guido’s social worker, Anna (Valeria Solarino), is Arturo’s unexpected romantic love interest. As Arturo confronts his past and Guido faces the pressure of competition, their initially contentious relationship evolves into a friendship that make both question their values. The Italian National Syndicate of Film Journalists awarded the Graziella Bonacchi Award to Luigi Fedele for his exceptional performance in this film that celebrates neurodiversity. Director Francesco Falaschi will attend the screening. The festival ends with two documentaries that won awards at Italy’s documentary film festival, Festival dei Popoli: THE CALL, directed by Enrico Maisto and OPEN TO THE PUBLIC, directed by Silvia Bellotti. Director Silvia Bellotti will attend the Closing Night Screening. The Closing Night screening will also include the announcement of the festival’s City of Florence Award for the best feature film in competition. The police personally deliver notices to appear to jurors assigned to Milan’s Court of Assize, which tries the most notorious crimes and massacres in Italy. At 10 a.m., sixty tense Italians take their places in the court’s somber chamber, where the lead judge addresses them. THE CALL, a beautifully shot and scored cinema vérité film, observes with profound humanity these unknown jurors tasked with the highest civil responsibility. Enrico Maisto’s documentary is an exceptional chronicle of that special day when a citizen comes into direct contact with the administration of justice. The Call was awarded Best Mid-length Documentary at Hot Docs and the Premio MyMovies Audience Award at Festival dei Popoli. The social housing authority of Naples manages the 40,000 public housing units of the city and province. Its offices, open twice a week, become the stage of vigorous verbal arguments between the employees—whose task is to apply norms and regulations with impartiality—and the multitudes of applicants who need help with housing. The people who apply for assistance are a diverse and quirky group, often living in existential and personal conditions that defy classification, thus presenting cases that cannot be easily solved. The beleaguered but kind social workers, who are truly on the front lines dealing with Naples’ impoverished citizens, face the system’s deficiencies with creative solutions, open hearts, and occasionally fraying patience. Bellotti takes on the bureaucratic process with humor, pathos, and a keen sense of humanity. Open To The Public won the Premio del Pubblico (Audience Award) at the 2017 Festival dei Popoli. Matteo Olivetti and Andrea Carpenzano turn in stellar performances as Mirko and Manolo, best friends who live with their single parents in a tough neighborhood of a Roman suburb. They are still in school, training to be caterers or barmen or something useful, and making minimum wage delivering pizzas. An accident sets off a chain of events, propelling them from good-natured, roughhousing buddies to thugs on the bottom rung of the local gang’s ladder, facing increasingly difficult choices. Isidoro, known as Easy, is lonely and depressed after an unexplained weight gain ends his career as a go-kart driver. When his brother Filo offers him a job so he can get out of the house and behind the steering wheel again, Easy accepts. The assignment seems simple, but the journey is epic: He has to ferry a coffin (containing the body of a worker) from Italy to a small village in the Carpathians, in Ukraine. Easy was nominated for Best Actor and Best New Director at the David di Donatello Awards and won the Jury Prize for Best Actor at the Monte Carlo Comedy Film Festival. Three young friends drive through the dark streets of Milan in Cosimo’s new black SUV. Eager to live up to his aspired bravura, Cosimo suddenly stops the car near a park where he and his buddies attack a random passer-by—in a frenzy of blows and imagined power. The real protagonist of the film is the vague emptiness that crosses the faces and bodies of these young men. Here and Now, a modern-day I Vitelloni on steroids, is a compelling portrait of youth who roam the streets in search of meaning. See review by Giancarlo Zappoli in MYMovies.com. A crooked producer dupes five hopeful Italians into traveling to Armenia to shoot a film. Nicola (Giuseppe Battiston), a rumpled history teacher, can’t believe his script will actually be produced, while flighty Patrizia (Silvia D’Amico) embraces her unexpected acting career. Their shooting location, the secluded, wintry Hotel Gagarin, becomes home when they are marooned in Armenia for months because of a military skirmish. There, this fine ensemble cast (including Luca Argentero, Barbora Bobulova and Claudio Amendola) find unexpected opportunities for creativity and happiness. Preceded by the short film THE WHOLE WORLD, ONE STEP AT A TIME. 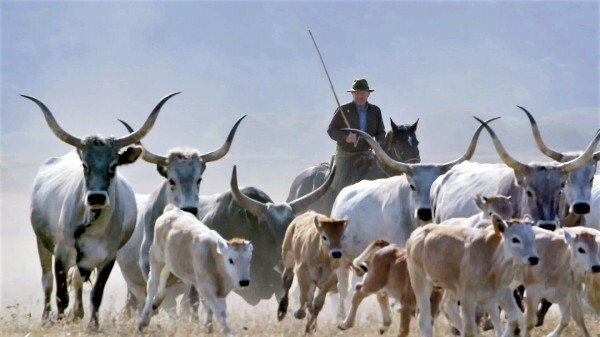 Walter Bencini’s beautifully shot documentary, a love song to the Maremma region of Italy, profiles the butteri, or cowboys, who work on one of the last ranches that breeds cattle and horses in the wild. Shot over the changing seasons in an area that stretches between southern Tuscany and northern Lazio, the film chronicles the lives of these amiable weather-beaten wranglers, their synchronicity with the rhythms of the land, and their relationship with the animals they steward. For anyone who loves the Tuscan countryside, this film’s exquisite lensing provides a close-up of sweeping vistas of the Tyrrhenian Sea, bucolic shots of cows (and the cowboys reciting their names), and a unique perspective on how an organic, free-range ranch carries out Italy’s slow food traditions. Antonio Padovan’s witty thriller unravels on the hills of Valdobbiadene, where Prosecco grapes grow. The film features Rade Serbedzija as a count fighting to protect his terroir and Giuseppe Battiston as a stubborn police inspector who has a murder to solve. The Last Prosecco has all of the elements of a good whodunit: politics, greed, multiple murders, and a cast of potential culprits, including the count’s mistress (Silvia D’Amico), his estranged South American daughter (Liz Solari), and his longtime housekeeper (Giselle Burinato). The Last Prosecco explores the lure of the vineyards, the effervescence of bubbles, and the conflict between those who are driven to exploit the environment and those who are called to protect it at all costs. At 18, after a five-year sojourn, Manuel leaves the education center where he was placed after his mother was jailed. He is unusually focused on his main objective: taking responsibility for his mother so that the two remaining years of her sentence will be commuted to house arrest. Shot in a neorealist style, Manuel features a stand out performance by Andrea Lattanzi as a sweet young man who desperately wants to do the right thing. MANUEL was a triple winner at the Montpellier Mediterranean Film Festival (Best Film, Critics' Prize, and Student Jury Prize). Many years ago, Rudy left his wealthy life in Italy, choosing to live in Bangladesh and assist homeless children there. His friend, Alex, joined him and together they built schools where poor children could receive education and healthcare. D’Agostino’s short documentary profiles the lives of Bangladeshi children, who are eager to learn in a harsh environment where access even to something as basic as potable drinking water is not assured. Together with their Bangladeshi counterparts, Alex and Rudy challenge poverty, corruption, and violence with care and love. This is a story about how every man can change his life by trying to change the world. The whole world, one step at a time. THE WHOLE WORLD, ONE STEP AT A TIME screens before HOTEL GAGARIN. Tickets: General Public $14; Seniors, Students, Disabled: $13; Italian Cultural Institute members: $12. Last edited by Chris Knipp; 11-26-2018 at 06:04 PM. The centerpiece of this charming little film is an Italian dish called Timballo. The star is a young man called Guido. With his pursed lips and sly eyes, and his perfect focus, Guido, in the person of the actor Luigi Fedele, is like a young Daniel Day-Lewis. His every gesture counts. His key declaration is this: "Il mondo ha più bisogno di un perfetto spaghetti al pomodoro che d'un bronzino al ciocolato" ("The world needs a perfect spaghetti with tomato sauce more than it needs sea bass in chocolate sauce"), a dictum he proudly attributes to "my master, Chef Arturo Cavalieri." Guido is an aspiring chef. Arturo Cavalieri is a fallen three-star chef whose anger issues have landed him in jail, but who gets early release for community service, whicch takes the congenial form of coaching a group of cooking students with Asperger's. Guido emerges as gifted. He can correctly identify by the smells every ingredient of any dish he's offered. Because of his gift and his precision in the kitchen, the awkward but handsome Guido is permitted to go off to compete in the Young Tuscan Chef contest, with Arturo as his coach and minder. The Timballo is an Italian baked dish consisting of pasta, rice, or potatoes, with one or more other ingredients included. When Guido makes the final bake-off with one other young contestant, the dish to be prepared is a Timballo with pasta. Every ingredient provided by the organizers must be used, and the final one is a crinkly cellophane bag of - chocolate. Guido refuses to add it, thus ceding victory to his opponent. But the sense of the scene is that Guido has the admiration of the audience, and of Arturo's own master, Celso (Alessandro Haber), who is also present, and after publicly tasting both Timballos, takes away Guido's chocolate-free one to savor it at his leisure and declares that the use of chocolate in the dish to be "pure heresy." Guido belongs with such off beat winners-by-losing in real life as Ivo Pogorelich, the pianist eliminated from the Chopin competition at Warsaw in 1980. The great Martha Argerich walked off the jury in protest, and Ivo became world-famous. Or three years ago the young self-taught Lucas Dubargue, who came in only number four in the Tchaikovsky competition in Moscow, but became the contestant most talked about since. It's of secondary importance that Guido's on the autism spectrum (though actual persons with autism may not be happy with such a representation). It simply means that, like most geniuses, he has to be handled with care, and his abilities are special. Guido's story questions easy descriptions of handicapped or gifted. Like an average boy, he longs most for a job and a girlfriend. This is also a comeback story for Arturo, whose damaged reputation means his only way back is to start his own restaurant. He is negotiating for that through the other action. And the followup a year later is satisfying. As Needed is a conventional feel-good picture, but it blends the ingredients in just the right proportions and has an arresting and appealing young protagonist. As Needed/Quanto basta,92 mins., written by Filippo Bologna and Ugo Chiti with help from director Falaschi and Federico Sperindei, was released in Italy 5 April 2018	and in Hungary in August. Luigi Fedele won the "emerging talent" award from the Italian National Syndicate of Film Journalists. The film was screened for this review as part of the 2018 San Francisco New Italian Cinema series, showing opening night, Fri. 30 Nov. at 6:30 p.m.
Last edited by Chris Knipp; 11-25-2018 at 10:46 PM. In a film inspired by a news story from Verona in 2004, three young friends aged twenty drive through the dark streets of Milan in a new black SUV. Full of aspirational bravura, the driver of the vehicle suddenly stops near a park where he and his pals attack an innocent person they met earlier in the day in a frenzy of blows and imagined power. Nothing is so evident as the young men's lack of affect or purpose. Here and Now has been called "a modern-day I Vitelloni on steroids." It is a portrait of youth without purpose, seeking meaning in random violence. Here and Now achieves some moments of genuine edge and shock unusual in contemporary Italian cinema, though it's overall effect remains rather patchy. 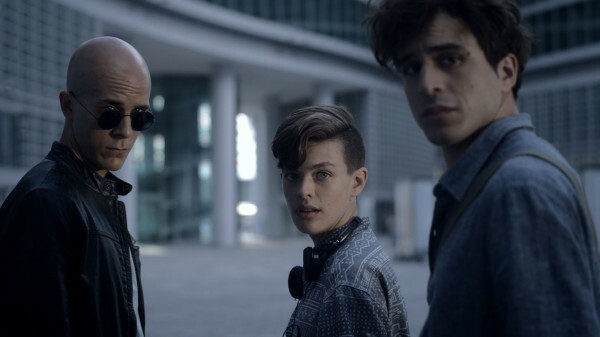 The three youths are Cosimo, or Cosimino as his friends call him (Yuri Casagrande), Riccardino (Claudia Veronesi - i.e., he is played by a she) and Giovanni (Gil Giuliani). Cosimino is a would-be tough guy. He has a rich, powerful father, he has a shaved head, he has the expensive black SUV his rich and powerful father (whom he gets on well with) has just given him, and he has the desire to make trouble. When he first appears he is working out with weights. Then he gets the SUV. He seems energetic, threatening, and dangerous, except that there is a smile that plays about his face much of the time that softens it. For a while he meets up with an older brother, who makes a lot of noise and kisses and embraces him. Riccardino is giggly, almost hysterical. Giovanni is depressed. It is Giovanni who is given the lengthiest segment by himself, an episode that may be more metaphorical than real. Giovanni is the son of a famous photographer. We learn that when he takes a train to visit an institute of photography where he is looking for admission. He rides with a plump, unprepossessing young man, also with a portfolio, also going to the photography institute, who is totally awed to learn who Giovanni's father is. This harmless young man goes to the bathroom and leaves his portfolio with Giovanni for safe-keeping. Giovanni takes the photos, rips them up, and throws them out the window. When Giovanni gets to his interview, the official dismisses the photos he shows as technically accomplished, but unimaginative, lacking in individuality. This seems to fulfill Giovanni's own expectations to the hilt. In fact, when Giovanni is with Cosimino and Riccardino in the SUV, they mock Giovanni for his passivity. He never does anything but take photos, they say. But is that a criticism? isn't that what a photographer does? Is Giovanni's flaw that he is passive, or that he is a photographer? Everything involving Giovanni is one-note and over-written. Another sequence shows Cosimino showing his two pals the spacious empty floor of a new building, which he says will become his office. Here is a moment when, in fact, they take a step away from the "here and now" and look to the future. Cosimino seems to have a promising future guaranteed to him, while Giovanni will presumably only go on being depressed and Riccardino, from what Cosimino mockingly tells him, will just be an underling sent out for coffee. Throughout, the film emphasizes new skyscrapers when it shows the skyline of Milan, which in Fabio Martina's vision becomes no different from any modern city, in Australia, perhaps, instead of the old, elegant Italian center of economics and fashion. Perhaps this film would feel more authentic if shot in South America. Why should Milan be turned into a generic city? Cosimino and Riccardino seem to share a giddiness, except that Riccardino seems (not surprisingly, since he is played by a female) effeminate, and borderline hysterical, while Cosimino at least wants to seem macho. But this is a film that ultimately seems itself giddy and excited, and not ultimately sure where it wants to be going. An editorial essay on the film on the website CameraLook cites the philosopher Umberto Galimberti as the source of the title, and attributes to him the statement that today's youth fear the uncertainty of the future and hence escape into an "absolute present." CameraLook links the film with the void we encounter in Antonioni's L'Avventura and Rossellini's Germania anno zero. It sees similarities in Gus Van Sant's Elephant. All this may be true, but that doesn't make Martina's Here and Now cohere in its own "here and now." Here and Now/L'Assoluto presente, 90 mins., debuted in Italy in Dec. 2017. It was screened for this review as part of the 2018 San Francisco New Italian Cinema series, where it shows Sat. 1 Dec. at 1:30 p.m.
Last edited by Chris Knipp; 11-25-2018 at 10:50 PM. The guy tells us right away: they are not Italian "cowboys." They are "butteri." In Argentina (and other South American countries) there are the "gauchos." In Hungary there are the "zigos." In America there are the "cowboys." And in Italy there are the "butteri." E basta. Once in a while a documentary comes along about something special and unique that is beautifully made, and this is such a documentary. This is an absolutely stunning documentary, and it is not yet listed on IMDb. It is as beautiful as it is filled with specific information, so it is richly informative and also aesthetically satisfying and thought provoking. It is not the new kind of intensive observation like those of Harvard's Sensory Ethnography Lab (Sweetgrass, Foreign Parts, People's Park, Leviathan), but of the more conventional kind, and there is much dependence on talking heads and voiceover narration by participants. But the tapestry is rich and the mood at times is enchanting, thanks to continually beautiful visuals of cattle, horses, men, and varied landscape, and the emerging sense of a way of life that is as tough-mindedly practical as it is moral and aesthetic. Alberese, in the Tuscan Maremma, is home to the last three remaining butteri, heroic men who still rear cattle in the wild, living examples of the possibility of redemption between humans and nature. They speak of the legends, Augusto Imperiali, Italo Molinari, and Mario Petrucci. The eyes of these men and their animals reflect the feeling they have of living a life with meaning, a life that they will never give up. Two young men have joined the group to learn this traditional craft, a tough job that few can do. Only one of them will make it. The future of this ancient world will lie in his hands. When we think of cowboys we think of vast western lands, and of course the Wild West, the frontier, Indians. The butteri reside in the Maremma region, a coastal area of western central Italy bordering the Tyrrhenian Sea. It was adapted and tamed in the past as a place where men could cultivate with animals and live in harmony with them (It was a malarial region, but that was ended by the Second World War.) It includes much of south-western Tuscany and part of northern Lazio. It is a civilized region, and a beautiful one, to which Walter Bencini's camera does full justice. The men we meet are civilized and dedicated, responsible raisers of cattle who, we learn early on, make a point of knowing the names of all the cattle and knowing the names of their mothers and grandmothers, and can recognize them by the contours of their horns, or their stride. Ever see that talked about in a Western? The young ones still hanker after it. The special, closed world. When the older ones say "Si ruba cogli occhi," you steal with the eyes, they refer to the fact that the old timers would never answer questions, you just had to observe them. An old timer provides background, how the region was developed under fascism, how most of the butteri then came from the Veneto region. This is an exclusive, macho world, whose toughness and pride are reinforced by making it hard to enter. An old timer scoffs at the idea of accepting a woman, because he thinks the work of today's butteri has become too physically demanding. Not only are the horses and the cattle and the land beautiful, but the men have a style that would make Ralph Lauren green with envy, a seasoned, unpretentious but inimitable elegance. They wear brimmed hats, but not the cowboy kind. They wear boots and leather chaps and vests, that look like a million dollars, or thousands of dollars of goods from Filson, the pricy Seattle outdoor and work outfitters. "The passion you have for this work is also a passion for these animals," says a buttero, and they speak of the satisfaction they take in training a horse, while another says his greatest love has turned out to be for the cattle. The men are uncomplicated, perhaps, but they are articulate in expressing the significance of their interaction with animals as the essential joy of their profession. Bencini divides the film into seasons, and also uses aerial drone shots for a new look at herding, both diagrammatic and beautiful. As time goes on, we also learn that the work of the buttero done at this farm is harder than ever, because they do more of the tasks of the farm, and don't just ride around on their horses all day as they did in the old days. The work requires absolute love and determination. Like being a classical musician, it requires that you start at it very young and that you have a natural gift for it combined with a passion that never lets up. And in this case, the salary isn't much. So when they put out a call for applicants, it's not 120 who turn up but 12, and of those only a couple are real possibilities. Through the course of the film, which was shot over a period of several years, we see only three full-fledged butteri and two younger aspirants, one of whom withdraws from the work after two years. This way of working with the animals, horses and cattle, out in nature, is what in principle everybody wants: it's natural, organic, slow food, all the good stuff. But in the distance faintly we hear the rumbling of machines, and the most experienced buttero of the farm who is the most authoritative narrator, and has the longest memory, can also anticipate the time in his children's lives that this way of life will fade away. With that Bencini's image itself of butteri on their horses managing the cattle, it too fades away. A fitting ending for a tough-minded but romantic film. The Last Italian Cowboys/Gli ultimi butteri, 95 mins., was released 18 Jun., 2018, distributed by Istituto Luce Cinecittà and Berta Film. Screened for this review as part of the New Italian Cinema series in San Francisco, where it shows Sat. 1 Dec. 2018 at 3:45 p.m.
Last edited by Chris Knipp; 11-25-2018 at 10:53 PM. Somewhere along the way I lost track of the various narrative threads of Antonio Padovan’s Italian provincial thriller/mystery. But with this kind of mystery, what counts is the atmosphere, and the main characters, aand these are all pretty good. The winemaker of noble birth whose demise begins the action, Count Desiderio Ancillotto (Rade Serbedzija), has a rough elegance that is irresistible. We know he is right, and cool, whatever he is saying or thinking, and we know his anger is justified. He disappears early on, but his spirit presides over the action that follows. The count's death seems obviously self-inflicted. We see him sit on a tombstone and quaff a bottle of his own prosecco and wash down a bottle full of pills. But soon there are a couple of murders. Authorities tell us the Italian white wine called prosecco can be spumante (sparkling), frizzante (semi-sparkling), or tranquillo (still, or literally "quiet"). For the Count it winds up being very tranquillo indeed. Stucky, the fledgling inspector on the case, as played by the very large (in height and girth) and currently very busy Italian actor Giuseppe Battiston, is the kind of guy you want to follow around. He is a giant teddy bear of a man, and his physicality inspires confidence, while his uncertainty as a detective awakens our sympathies. He is Persian-Italian, and watever that means, it's part of the layered complexity of a story that's meant to tease and perplex us. The other star of the film is the rolling hills of Valdobbiadene, in the Veneto, a region, like so many in Italy, so photogenic it makes you wonder why you stopped going over every fall. The Last Prosecco has evil polluters, political manipulation, a crazy man in a graveyard scraping off rust and talking to the dead. He may know someting. There are three women, the count's mistress (Silvia D’Amico, who will be demoted to prostitute in Hotel Gagarin), his long-absent daughter (Liz Solari), who's been living in South America, and his bossy housekeeper (Giselle Burinato). When the housekeeper orders Stucky to get out, and he doesn't, and stays to talk to the daughter, we realize he has some authority, after all. This is an environmental drama whose resonance is considerably enhanced by the beauty of the local location where the popular prosecco, sometimes a substitute for champagne and also used in the Bellini and spritz cocktails, is made. This is Padovan's first feature after a series of prize-winning shorts. He was schooled in film in New York, and made a short documentary about the tidal wave and earthquake in Japan. He returned to his native Italy to make this film in 2016. The Last Prosecco/Finché c'è prosecco c'è speranza ("As long as there is prosecco there is hope"), 101 mins., debuted in Italy in Oct. 2017. Screened for this review as part of the New Italian Cinema series in San Francisco, where it plays at the Vogue Theater Sat., 1 Dec. at 6:00 p.m.
Last edited by Chris Knipp; 11-03-2018 at 05:32 PM. Hotel Gagarin, an ensemble piece, is a movie road movie. 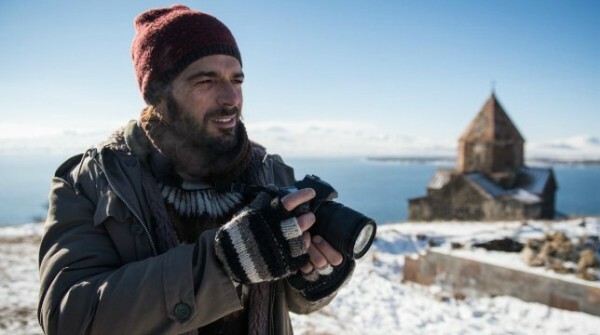 It concerns the ostensible making of a film that requires a group of (mostly) Italians to go to Armenia, in the southern Caucasus, in wintertime. But it's a scam, filmed as a good-humored, slightly bawdy joke, that turns serious, and risks a delicate sentimentality. The tale begins with a disreputable producer called Franco Paradiso (Tommaso Ragno), who assembles a group of suckers for a movie he never intends to have made, simply to raise European grant money and abscond with it. Whether all this makes sense is secondary. Simone Spada, the director of Hotel Gagarin, is mainly concerned to lead us pleasurably from one scene to the next and fill each of them with a colorful character and a dream. After Paradiso, the next individual we meet, a jovial giant of a man, is a naive professor of history and cinema appreciation, Niccola (the ample-bodied Giuseppe Battiston, who recently played the quizzical detective in The Last Prosecco). We see him lecturing a class of arrogant know-nothings, whose interest in and respect for cinema is nonexistent, when he suddenly receives a blunt call from Paradiso saying he's going to produce his scenario and that work on it starts tomorrow, and he'd better show up. Well, this has long been Nicola's dream. What has he got to lose? To lead his fake "crew," Paradiso calls an Italianized Russian "events planner," Valeria (Czech-born Barbora Bobulova, who has a raft of good Italian films to her credit). No stranger to Paradiso's crooked dealings, she is on on the scam. She will be his ally and get a substantial cut for leading the scam in Armedia, or at least he allows her to believe this. He finds a real photographer called Sergio (the handsome Luca Argentero), who's on the run from the Mob for a bad debt and will accept any excuse to disappear for a while. Off the streets of Rome he grabs a prostitute, Patrizia (Silvia D’Amico), who he promises will play the lead. He picks up Elio (Claudio Amendola), an electrician with no movie experience, and a handful of others. The naive Niccola is too excited at the prospect of having his scenario made into a film to question the credentials of any of these dubious characters, though the smallness of the crew does worry him. There is also a drunken local "guide" called Aram (Hovhannes Azoyan), a goofy mime, like Harpo Marx, and a few others. They all wind up at a tall, wide old hotel on a barren hill, the Gagarin, named after the Cosmonaut, Yuri, and placed the middle of a snowy vastness, a setting Wes Anderson might have liked. This promises to go very badly for the poor dupes out in the chilly Caucasus - especially when it turns out there is a war going on: the Azerbaijani army has been firing on the Nagorno-Karabakh. And you know how it is when they get at each other. The visiting "filmmakers" are forced to remain in Hotel Gagarin: moving around outside, for the moment, would be too dangerous. Phone contact with the outside is also cut off. And then the villagers from nearby come to them, hearing word that great Italian cinematographers are on hand, and wanting to have their own fantasies put on film. These include a white-bearded geezer (Ara Sargsyan) who always wanted to be Yuri Gagarin. The motley crew obliges, participating in games and pantomime, eventually faking filmmaking in a way that, at least for Nicola, who becomes the director, is satisfying to the imagination for him too. When eventually an emergency unit comes from the Italian embassy with a plane to rescue them, the satisfaction is bittersweet. For a while we, the viewers, participate in their fantasy, though its realization depends on a lot of our good will and a lot of Simone Spada's montages. Not everyone goes back, not Patrizia, who likes it better here, and goes off on a horse with Aram. Elio, whose role as electrician is much grander here than it was back home, may not be inclined to leave either. Maybe the De Sica and Zavattini of Miracolo a Milano would have understood this scatterbrained, genial fantasy. The whimsical end credits are choice. The scenario was coscripted by Spada and Lorenzo Rossi Espagnet. Hotel Gagarin, 93 mins, released in Italy 24 May 2018. It was screened for this review as part of the 2018 San Francisco New Italian Cinema series, where it is scheduled to show at the Vogue Theater Sat., 1 Dec. 2018 at 8:15 p.m.
Last edited by Chris Knipp; 11-28-2018 at 01:42 AM. Forty-four-year-old documentary filmmaker, musician and a photographer Dino Albertini has made a strong, austere first feature in a neorealist, vérité style focused on a preternaturally grownup 18-year-old released from a foster care center, Manuel (assured newcomer Andrea Latanzi, who carries the film with firm conviction and a cool, focused intensity). Manuel must go to live in his mother's flat and establish his credibility as a responsible adult there so his mother Veronica (Francesca Antonelli), who is in prison, may be released to house arrest. The film moves with a sharp, harsh rhythm in the cutting by editor Sarah McTeigue. The music is mostly the cry of voices, the distant sound of trains. The tall Latanzi is a lithe young everyman of heroic composure. He grouses to the foster home supervisors and the opening shows the no-nonsense life there, but also the warmth. A gardener is a former inmate who never left who says a sweet goodbye, and the lay brother who takes him to the station jumps out to hug him. Albertini interpolates a vivid interlude before Manuel gets to the apartment. There's no train, it's suspended for hours due to an accident. In the interim Manuel helps a mute, impoverished man with his motor-cart and gets a ride to his tiny dwelling, where a pretty young woman comes who provides her own social services to him. She is an actress preparing an audition and later Manuel helps her rehearse lines from Truffaut's Stolen Kisses. It is if she is seducing him. But Manuel is not to be distracted from his goal, and bam! we're on the train, which takes him to a trio of grim high-rises like the Paris banlieu. This is where he's going to live. He has to track down the manager at a tango class. The place is by the shoreline, but you can't see the water from the little flat, which is a total wreck. He must begin by gathering up and throwing out. When Manuel has gotten the job, braved various temptations and opportunities any 18-year-old boy would welcome, when the social worker has examined him and the flat and the hearing for his mother with the lawyer has been endured and the house arrest release has been guaranteed in one week's time, and Manuel is on his way back to the flat, he can finally have a panic attack and break down in uncontrollable sobs. He has accomplished the impossible and he will go on to face the difficult and unlikely with stoicism. It's a virtuoso performance by the young Latanzi, but it feels like living, not acting and Albertini's austere style has never seemed showing and always served the action. Hardly a fun watch, but an impressive film that promises a one-person neorealist revival by this very serious and committed filmmaker. With Latanzi in the cast are Francesca Antonelli, Giulia Elettra Gorietti, and Renato Scarpa. The screenplay is by Albertini with Simone Ranucci; the cinematographer is Giuseppe Maio. Albertini began with a documentary, La Repubblica dei Ragazzi, about the development of a group foster home, the one we see in the opening minutes, based on months of careful observation. 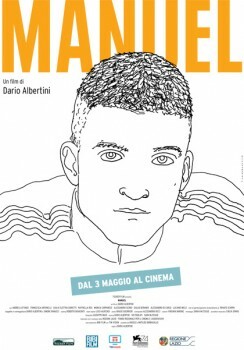 Manuel, 97 mins., debuted at Venice (see Albertini's note written then), and was a triple winner at the Montpellier Mediterranean Film Festival (Best Film, Critics' Prize, and Student Jury Prize). After a positive reception in the Rencontres Cinématographiques section at Cannes, it opened theatrically in Paris with the title Il filglio, Manuel 7 Mar. 2018 and was extensively reviewed with moderately positive results (AlloCiné 3.5). French critics praised Latanzi's "superb" interpretation which gave the whole, despite its unsurprising trajectory, "a powerful emotional density." L'Humanité noted that "Pathos is eschewed throughout, the extraneous eliminated," the filmmaker's documentary experience contributing to his "confidence in the power of the real." Cahiers du Cinéma foresaw a "positive future for its maker," and Les Inrockuptibles called Manuel "A 'popular' film in the best sense, i.e. one that sees its characters of the people, free-standing and upright in their dignity." The French can understand this film's style. It evokes the Dardennes, even Bresson. It also refers explicitly to Truffaut and it's been said Latanzi/Manuel is Albertino's Antoine Doinel. But this is nonetheless a film that, like the looks of its astonishing young star, is deeply Italian. 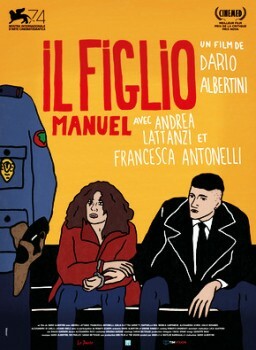 Manuel was screened for this review as part of the 2018 San Franisco New Italian Cinema series, where it shows Sun. 2 Dec. at 12 p.m.
*"Una ruvida eroica autentica fragilità" (Fabrizio Tassi, Cineforum). Last edited by Chris Knipp; 11-28-2018 at 01:44 AM. Two young men, childhood friends, Mirko and Manolo, live in a bad suburb of Rome with their single parents. They are in restaurant trade school and delivering pizzas, and driving around one night with Mirko at the wheel, hit and kill a man. They flee without thinking and are terrified. Manolo takes the problem to his unscrupulous dad (Max Tortora). He comes back next day with great news: the guy they killed was a police informer and killing him puts them on the good side of a gang. Before long, though Manolo tries to muscle Mirko out at first, the two best friends are together as low-level assistants. They kill people. They maintain prostitutes on the street; Mirko does, anyway. They help out with drug production (or observe it). There is talk of selling 15-year-old girls. Supported by his low-life gangster wannabe dad, Manolo seems the most guilt-free. Mirko (the actor has big wide frightened blue eyes) is troubled all the time, gets on badly with his mother (Milena Mancini) and drives away his girlfriend (Michela De Rossi). (More focus is on Mirko throughout.) The Innocenti brothers, whose debut this is, lay it all out with smooth rhythm. Their primary actors (especially Matteo Olivetti in the main role) are fresh and convincing. 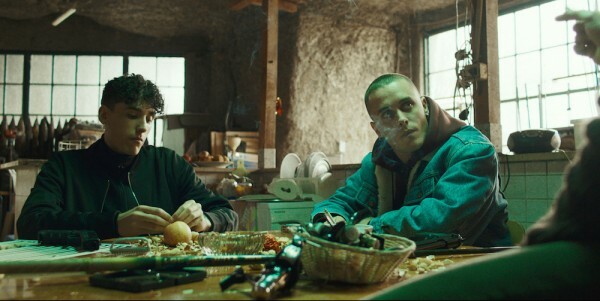 The film seems to take a page from Matteo Garrone and this could be a chapter from his celebrated but grim Gomorrah and part of a new school of more naturalistic and even sociological gangster film that's emerged in Italy. is merely impressed. "What makes the film so fascinating to watch," he says, "is that the psychology of the boys keeps bubbling to the surface organically, making it easy for audiences to understand the thought processes behind their (frequently not advisable) actions. And, of course, there’s the irony that to digest the fact they killed an innocent man, they turn to killing more men — except now they are not always that innocent." Yes, there is that irony. Watching this film makes one feel dirty - and unenlightened. Perhaps that is intentional. The best irony comes when two gang bosses discuss sending Mirko and Manolo in to kill a bigger shot, a threat to the clan's authority (before they've killed only the infame, the "grass," the "informer," and Moroccans who owed money), and it turns out the bosses find the boys shockingly amoral. "Those two don't care about anything!" Even in the gangster world their values make them outsiders - who don't matter, because they came in from nowhere, with an eagerness that was suspect. This dialogue, like the talk of the boys, is overly explicit. This film doesn't like gray areas. It hasn't the time. It's not a gangster epic, just a series of vignettes. Filmmaker brothers Damiano D'Innocenzo and Fabio D'Innocenzo spent their childhoods on the outskirts of Rome painting, writing poems, and taking photographs, and in this promising feature film debut indeed show an excellent sense of the cinematic medium. As van Hoeij notes, some counterintuitive shots work well, particularly a long, slow distant shot of the desolate area of shacks where the boys are going to have to move in for the kill, perhaps the most memorable moment of the film. Every moment is harsh, vivid, and intense. Meaningful is another matter. A second viewing did not leave me feeling any the wiser, but the scenes still seemed realistic, if perhaps a little glib and, as hinted, over-explicit. Boys Cry/La terra dell'abbastanza, 94 mins., debuted in the Panorama section of the Feb. 2018 Berlinale, also showing at Genoa, Edera, Chicago, and Miami. It won five Italian festival awards and was included in Open Roads: New Italian Cinema at Lincoln Center May 2018. Screened for this review as part of the San Francisco New Italian Cinema series, where it shows 2 Dec. 2018 at 2:15 p.m.
Last edited by Chris Knipp; 11-28-2018 at 01:52 AM. Isidoro (Nicola Nocella) is known as Easy but his life isn't that, not for him. His career as a go-kart racer has ended, ostensibly because he has grown too fat. But he admits later another cause that may have to do with an addiction to unspecified drugs. And easy is depressed, or rather very glum. Easy, and the events that follow, would be very much at home in a film by the Finnish director Aki Kaurismäki. Depression becomes a kind of cheerfulness, gloom a kind of hope. When all other lights go out, that little candle remains inextinguishable. And like all great travelers, Easy is granted a mission. A Ukrainian worker called Taras dies on a building project run by Easy's brother Filo, and Filo gives Easy something to do: drive a hearse with Taras' coffin to his home in Ukraine, in the Carpathians. He is given an apple, a nice new hearse, a smart phone set to translate from Italian to Hungarian, and a GPS programmed to direct him the whole way. And off he goes. A simple task. Not so simple. In fact a journey of almost epic frustrations, but also of much drollery. The director, Andrea Magnani, who hails from Rimini, the birthplace of Fellini, and now divides his time between Trieste and Rome, makes fine use of eccentric locations and peculiar people. As soon as Easy gets through Hungary into Ukraine, and gets lost, while he is on the phone talking to his brother, a car drives up on the highway - Easy has gone out in a field to get phone reception - and drives away the hearse. The coffin they leave. Easy proves remarkably steadfast in sticking with the coffin and his task. He will be on a horse-drawn cart piloted by an aged, bearded, somnolent geezer; floating down a river astride the wooden box; driving a tractor with the box mounted in front. He will pull it uphill on wheels. This is partly, but not wholly, a journey of transformation. When border guards complain that Easy's passport photo doesn't show him in his current big bushy beard, he steps inside the gents' and shaves it off. Somehow Easy's girth protects and sustains him. It is as if he has a lot of layers to protect him. If some of them away, he's still inside. But, "Wherever you go, there you are." It is always Easy and it is never Easy. In the end, high up in the Carpathians, he reaches the deceased Ukrainian worker's proper family with his coffin and they provide him with a proper burial. Now what do I do? our hero asks. Fade to black. Easy was nominated for Best Actor and Best New Director at the David di Donatello Awards and won the Jury Prize for Best Actor at the Monte Carlo Comedy Film Festival. Andrea Magnani, born in Rimini in 1971, lives in Rome and Trieste, and has a degree in political science. He was a finalist for the Solinas Prize in 2002 and was selected for the first edition of the Berlinale Talent Campus. Magnani writes for cinema and television. He has directed several documentaries, including Caffè Trieste (2009), awarded Best Documentary at the Trieste Film Festival (Zone di Cinema), and Watching Me is Enough (Basta guardarmi, 2006), selected for the World Film Festival in Montreal and the Giffoni Film Festival, among others. He is writer and director, along with Davide Del Degan, of Paradise, a co-production between Italy and Slovenia, in theaters in 2018. For television, he is the writer of the series Inspector Coliandro. Easy (Un viaggio facile facile) is his first feature film. Easy/Un viaggio facile facile, debuted at Locarno Aug. 2017, also showing at (logically) Helsinki and Zurich. It was screened for this review as part of the 2018 San Francisco New Italian Cinema series, showing 4:30 p.m. Sun. 2 Dec. 2018. Easy won the NICE City of Florence Award for Best Dramatic Feature by a First or Second Time Director at the San Francisco event. Last edited by Chris Knipp; 12-06-2018 at 09:22 AM. In Italy, as in America, there is jury duty. It begins with the selection of the jurors. This is the process mainly focused on in Enrico Maisto's short documentary. We are in Milan, the Assize Court of Appeal. They deal with big stuff, murder, mafia, terrorist acts. There are two judges, and the chosen jurors, actually known as giudici popolari, "popular judges," are six, and sit beside them, three on each side, and confer with the judges, arriving at decisions collectively. Someone remarks that the courtroom style, no doubt with the mosaic mural decorations in mind, are an example of the grandiose look of the fascists that appealed to Mussolini. Couldn't it just be the Italian manner? Italian public spaces tend to be grand and widely proportioned, and such is the case of the Italian Court of Assizes of Milan. Anyway, here they are all are, called to do their civic duty, serve justice, if they can, and maybe have an interesting time. This is their emotional first contact. Someone refers to "Sironi," Luca Sironi, whose photo-essay showing the ruthless architecture of deserted Italian courtrooms is, apparently, well-known. The film spies on some of the sixty assembled prospective jurors skillfully. The camera, unnoticed, is tight on faces of the men and women, and the microphone, unseen, gathers up a seamless blend of interesting snatches of their conversations. There are a host of feelings and thoughts. At first there is grousing about time lost from work, even of how hard it was to find the court. There are fears, that they may not be up to the task, that their involvement may put their lives in jeopardy. The latter the female judge conducting proceedings doesn't totally allay. First she says the accused are behind bars, so can't do them any harm. Then she admits that many of the accused are linked with the mafia and jokes that if there were danger, the court would all be dead by now. Some are concerned at losing money. One well-dressed gentleman says he has lost fifteen hundred euros just by being away from work this day, though, he adds later, with a smile, luckily the business can function without his presence. Others talk about how essential work, or the lack of it, will determine their serving, or not - or the caring for a sick mother. One lady, with bushy gray hair, says she does not work, and she can do the juror's job, and would like to. We don't know how the "popular judges" are chosen, but the comment of a judge about this film (an approving one) notes that at this opening encounter it's important to learn if the candidates are disposed to "administer justice with passion (and hence, commitment), or with indifference and annoyance." Part of the annoyance might come from the fact that in Italy the potential jurors are summoned at home not by a postcard, as in America, but by a home visit from the carabinieri. In time, conversation turns to growing enthusiasm for the task, doing one's civic duty, learning about the law, just hearing interesting stuff. Ladies also talk about their future plans, when they are not working, other jobs they'd do. Volunteer in a prison? No, the bushy haired lady , now a chosen juror, says, she'd rather work in a library. It's repeatedly made clear that only the jurors' "common sense" is required, no special knowledge. On the other hand, they may have to read many pages of court documents about previous trials now being reassessed. And by the way, however long individual trials run, jurors serve for three months. One gets a sense that a more unified culture and a higher level of education is assumed here, and that's evidenced by the dialogue we witness. The chosen jurors and alternates are also each called upon to read aloud what sounds like a pretty sophisticated statement of their pledged duties and responsibilities - ending in a promise of confidentiality. What's not clear is the way the trial will proceed, and even the specific details of jury selection. In the courtrooms where I've been called to jury duty, you have the judge, the jury, and the lawyers for the court and the defense. Each potential juror is asked basic questions pertaining to his or her background and relation to the case and those involved, and the lawyers are allowed a certain number of dismissals. Here, the potential jurors are called away to another room where the questioning goes on unseen by the rest of those called in, or by us. Presumably only the two judges make the choices, since we see no lawyers. 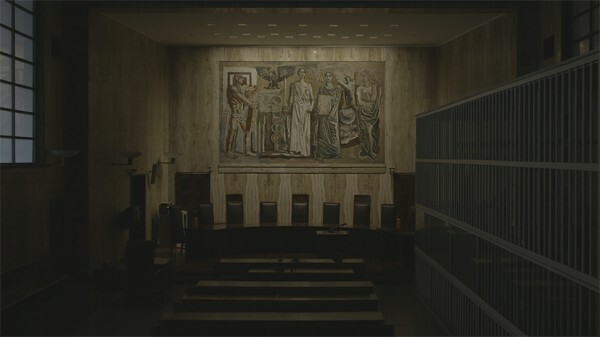 A review of the other documentary shown at the New Italian Cinema series, about a government office's bureaucratic functioning, compares it to a film by Frederick Wiseman, which, it says, "captures the gears and mechanisms of the institutions," whereas the Italian one "seems like a theater of the absurd." Well, of course, we realize, the reach and influence of Wiseman's prodigious oeuvre must be global, and we can feel it in how these two films are constructed.. But what limits this one is that its camera doesn't move as Wiseman's would to the other rooms to observe other parts, even the most trivial, of the court's work, not to mention the crucial one of jury selection . But within its limitations, Maisto's documentary is humane and fascinating, and a civic lesson too. The "convocation" filmed here took place in 2015. Rather astonishingly, the end notes tell us, the jurors called up met for the last time "to pronounce the sentence 22 July 2015 for the massacre of Brescia that took place in the Piazza della Loggia 28 May 1974." This was a reconsideration of a previous case that was reconsidered before, and the charges dismissed. This time Carlo Maria Maggi, leader of the far right organization Ordine Nuovo, and Maurizio Monte, collaborator of the secret services, were sentenced to life imprisonment. It was announced to the jurors at the outset that new testimony from a "pentito" (a "Years of Lead" terrorist who turned state's witness) was going to be heard in the 1974 bombing in the main square of the city of Brescia. Big stuff - forty years later. The Call/La convocazione, 56 mins., showed at Milan, and in documentary festivals in Tremblay-en-France, Toronto (Hot Docs), Linz, Florence, Budapest, Munich, Široki Brijeg (Bosnia), and at DMZ Docs, South Korea. Theatrical release in Italy began 15 Jan. 2018. It was screened for this review as part of the 2018 San Francisco New Italian Cinema series, where it showed at 7:15 p.m. 2 Dec.
Last edited by Chris Knipp; 11-28-2018 at 06:14 PM. Let's begin by referring to a review of Open to the Public by Gianpiero Paganelli for Quinlin. After wondering what complicity there may have been between the documentarian and the bureaucratic underlings depicted "How did he convince them to remain natural, to behave as usual, uninfluenced by the proximity a camera?" Did they not realize they were revealing the "evils" of a "slow bureaucracy" that gums up all Italian public affairs" he asks; but he also concludes that if Bellotti wanted to produce a satire, she wound up with something else. What is it? A picture of desperation, meanness, petty efforts at kindness - a terrible quagmire, whose like exists, no doubt, in many other countries. It sometimes exists also in America. But Paganelli cites a famous American filmmaker: "Unlike a work by Frederick Wiseman, which captures the gears and mechanisms of the institutions it depicts," he writes, "Open to the Public is like a theater of the absurd, a grammelot (commedia dell'arte gibberish-talk), in which one does not understand what is happening, because the language used is such a total deconstruction of one we commonly use." When I worked in Egypt, the local employees of the school where I worked took care of all bureaucratic operations for the faculty, which involved, of course, long years of familiar contacts, charm, smiles, cups of coffee, and baksheesh. When I worked at a wholly local school in Morocco, there were no facilitators provided. And as for baksheesh, it seemed that the bureaucratic underlings would much rather make life miserable for people than line their pockets. That seems the case here. We are at the Autonomous Institute for Popular Houses of Naples. That appears to mean the public housing office, and it's responsible for running 40,000 units. The sea is right ouside, through a window. The joke is, the public can only come to seek documents or complain from 8:00 a.m. to 1:00 p.m. and from 2:00 to 3:00 p.m. on Tuesdays and Thursdays. What do the employees of the office do on the other days? Maybe nothing. Isn't that why people go to work in this kind of place? Or they sort through random piles of sometimes matching, sometimes motley files - whose function one knows is superseded by what's in the computer data bank, now the final authority. In Egypt, with the facilitators, I never once entered the Mugamma, the Pentagon of downtown Cairo where files seemed to reside. In Morocco, I spent most of my year every afternoon with a friend, trying to get my car registered. If I filled out a yellow document, it turned out a pink one was what was needed. You had to take it to another building, or upstairs, and come back in a week. Similar instructions are dealt out by a lady named De Stefano at the Naples Autonomous Institute for Popular Houses. Some individual cases emerge. A woman of Indian descent, though she speaks correct Italian (the Neapolitan dialect of some of the others you could cut with a knife), is living in a house with four children suffering from pulmonary diseases. The house is falling apart from rot from humidity. Repairing it will be a major operation. It will take several months, and they will have to live somewhere else. A man called Salvatore Graziano takes her in tow, and actually gets this process under way. At first she has no place to move, but says she'll live on the street if it gets the job done. Later, she and Salvatore meet up again, and she says she has many places they can stay, she just wants to know the date when it begins. Hopeful. Many times the answer is "No." No, you are not a legal resident. No, you cannot be registered to live with your boyfriend. No. we cannot file that document here. No, no, no. That's the key word in the grammelot. An old lady comes who complains that someone who lives upstairs on the twelfth floor has registered as living with her. As she is questioned, her story changes. The woman on the twelfth floor is a step-niece. And the old lady signed for her, some time ago. But she doesn't know what she did: she can't read or write. Is she inventing this for her amusement? Or is she confused? She is worried. But has she created the worry herself? After a while, it emerges that one reason this isn't a simple satire is that the supplicants who come are partly, at least, to blame. Their affairs are a mess. They didn't keep proper track of the documents. Not that the documents would ever have been right, but still. But in the end, Paganelli notes, "a clerk says to the people in the long line, with calm we will resolve all your problems. And we will also offer you a cup of coffee." It all may be stupendously muddled and inefficient. But it's all part of the culture. Open to the Public/Aperti al pubblico, 60 mins., debuted in 2017 at the Florence Festival dei popoli, winning the popular prize (Premio del Pubblico), also showing in Sardinia, at the Jean Rouch Festival, Napoli Festival, Krakow, and Cartagena. (No IMDb page.) It was screened for this review as part of the 2018 San Francisco New Italian Cinema series, where it showed as the final event with The Call/La convocazione on 2 Dec. at 7:15 p.m.
Last edited by Chris Knipp; 11-28-2018 at 06:08 PM. one of the narrators of this ten-minute documentary went to Bangladesh on a six-month trip in 2001, and has never come back to Italy. Another came in 1998 and has been there twenty years. They have remained in the country working with others to better the conditions of this very poor country.Marco Baggiani is the founder of Pag'ono Pag'ono, an organization to improve schools. Rudy Bernabini is the regional director of teh organization. Alessandro Mossoni runs Filodijuta, a fundraising organization. These same people are involved in groups that provide medical assistance and potable water. This little documentary is a kind of advertisement for what they are doing. When you see this desperately poor but improving country and these bright eager faces of children, your heart will break and you'll want to take out your checkbook. This is a beautiful little film. Gianmarco D'Agostio is a documentary filmmaker from Arezzo who is interested in social issues. You will find a detailed bio of the filmmaker on IMDb HERE. He is forty-one and comes from Arezzo. Last edited by Chris Knipp; 11-06-2018 at 10:30 PM.